This versatile 2" Orion Variable Polarizing Telescope Filter acts like a dimmer switch for your telescope, toning down the brightness of the Moon or planets to a comfortable level and revealing more surface details. The 2" Orion Variable Polarizing Telescope Filter consists of two high-grade glass polarizing filters in a rotating cell that allows you to vary the amount of light transmission from 1% to 40%. 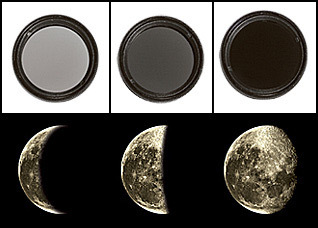 Such control is highly desirable for lunar observing because of the Moons brightness varies with its phase and with the aperture and magnification of the telescope you are using. It's also a must for viewing the Moon in daylight hours. Reducing the glare to an optimal level will reveal dramatically more lunar and planetary features, without significantly altering the object's color. The anodized aluminium cell threads into the barrel of any standard 2" telescope eyepiece. Includes a durable plastic storage case.